The lighter colour of the metal (9ct rose gold) gives the earrings a crisp and modern look. The beautiful stones are cloudy and frame set, and give the pieces a very soft and feminine look. The large stones are attached flexibly to the small stones and sparkle with movement. 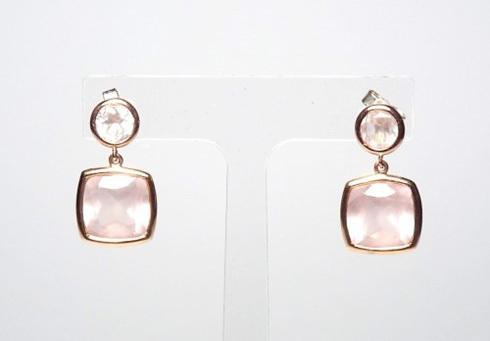 The rose quartz earrings are light in weight and are very easy to wear with a secure butterfly fastening. Please note that the butterflies are made of sterling silver. The colour difference is not visible when worn. The earrings are handmade, hallmarked by the Assay Office London and carry the maker’s mark ‘MMzS’. Dimensions: 2.1cm x 1.2 cm, 6mm pavilion on the large stones. Material: Rose quartz and 9ct rose gold, the butterfly earring backs are made of sterling silver.